When I was growing up as a kid in the 80s, Aspergers wasn’t a diagnosis, I was just a weird, clumsy and shy child who didn’t make friends that easily and never kept the ones I made. My parents faced with this weird, shy child enrolled me in drama classes when I was 7 years old in the hope that it would cure me of my shyness. I always remained a quiet kid, but the 13 years I spent doing drama classes had a massive impact on my life and helped me overcome some of the challenges of my Aspergers. 1. The drama classes gave me a wonderful opportunity to learn social skills. In acting out small scenes, I learnt the appropriate responses to certain social situations and got to try out various scenarios without embarrassing myself or offending anyone else. Also, I got to witness first hand how people reacted to inappropriate responses and understand the reasonings behind their reactions. 2. The drama classes gave me a safe place away from the bullying I faced every day at school. I made friends there who remained friends for my entire 13 years of drama school. It gave me a social life that would have never been possible otherwise. 3. My drama school had a theatre attached to it where we ran about 3-4 musicals/pantomimes a year. Whilst this gave me many opportunities over the years to be in productions, the theatre also allowed us students to learn many theatre trades such as lighting, sound, stage management, set design & construction etc. Many of my fellow class mates went on to work in these areas professionally. We also worked as ushers, program sellers and in the box office & canteen. Through doing these jobs, I learnt not only valuable skills I could take into my working life but also how to interact with complete strangers. 4. Because of the years of drama classes I did, I can now basically ‘perform’ when I’m in social settings. I still don’t find them comfortable or enjoyable but I can survive them for a couple of hours. I’m able to hide the outward signs of my Aspergers so that most people who meet me are unaware that I even have it. I know this sounds a little disingenuous and deceitful but it has helped me get through life. I would encourage every parent of a child with Aspergers or autism to enroll them in their local drama school. Not every kid is going to enjoy the classes, like I did, but it is worth persisting with for at least a semester. If your kid still hates it after that, then let them stop doing them. They aren’t going to learn anything from an activity they find painful and upsetting to do. However, for the kids that do enjoy the classes, the benefits they can get from them can be life changing. For those of you living in LA, check out The Miracle Project – a fantastic theatre and film program for kids with special needs such as autism and their siblings. If anyone has any recommendations of theatre/drama programs for kids with special needs in other areas/countries, please let me know and I will add them to this post. This entry was posted in Autism and tagged Asperger syndrome, Autism, drama, Special needs, Theatre. Bookmark the permalink. Hi, I did a lot of drama in school as well. One of the more interesting documentaries is Stagestruck which deals with children/students at the Lyric Theatre in London. 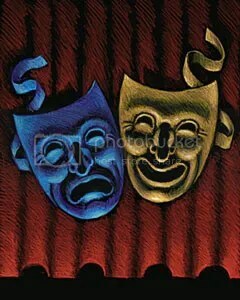 My Aspie teen wanted to attend drama class for a few years but he wasn’t ready, he couldn’t handle it before this year. He just seemed to reach the right age earlier this year and he has totally loved the drama school he’s been going to, he’s got a lot out of it – more confidence in speaking to strangers when shopping, the ability to address a group of people, the social situations and behaviours that are acceptable/expected. Ro, it sounds like your son is getting so much out of his drama classes. I hope he continues to love doing them and gains even more confidence. I had a kids starting HS who I work with who loves dabating, perhaps he likes being able to have a clear line of arguement, and he seems to be ok with being ale to argue against what he thinks is true, at least for the debate! Might be a way of learning to order your arguements? I loved reading your article. I had the pleasure of having 2 kids who had Aspergers and few with other related disorders in my summer camps this year. As a Drama Teacher is was so rewarding to see how wonderful these children did at camp. I have one returning to regular classes which I am so excited. Thank you for your wonderful insight. I hope you don’t mind if I copy your article & pass out to my potential parents. Thanks so much for the compliment, Sandy. I’m honoured that you think my article is good enough for you to hand out the parents of your drama kids. I hope that your Aspie kids continue to enjoy the drama classes. Thanks so much for this – it only reconfirms the strengths I see in my son! He is 6. My hopes for his future have just been buoyed up further by your interesting take on life with AS. He is a very high verbal, high functioning guy and the actor within is so apparent to me. It is his true joy to put on a hat sing, dance and “be someone else” for a while – and he’s good at it. Theatre classes for him are something I have been thinking about but now I am sure. Best wishes to you! What an astonishing story you have. I encourage you to keep writing it! I’d love to speak with you/interview you about your experience with theatre growing up with Aspergers. I am actually the Music Director for The Miracle Project, and I was tickled to see your mention of our program. I actually lived in Vienna in the 90s (as an opera singer) and would love to connect with you. We have brought the Miracle Project to India and around the U.S. We are interested in bringing the Miracle Project principles to Europe. Elaine Hall (the founder) and I have talked about the fact that I’m fluent in German and Italian and speak reasonable French as a means to connect with Autism/Aspergers organizations in Europe. Anyway–would you email me at katianamusic@mac.com OR autismandtheartsinfo@gmail.com? I found drama very useful as well many years ago. I never thought about why, but as you say playing out different situations and scenarios gave a useful behavioural toolbox. I think that works for anyone, not just kids with social difficulties. Thank you so much for this article! I am a single mother of my 9 year old son who has Aspergers. I have tried finding things to help him over the years, but hadn’t considered acting/drama classes. We live in Southern Ohio and I’m going to see if there is anything like the Miracle Program here. Thank you so very much! Well its a long time between posts but wanted to add something anyway. Thank you for this piece, its encouragement for those of us Teaching Drama to children on the spectrum is fabulous. There is now a program in Qld Australia called “3DKIDZ” Drama for Developmental Disorders that targets specific areas for the students through the platform of drama.. Its just kicked off starting 2013. Its truly wonderful to have something that offers hope to children and their families. Thanks again! The New England Youth Theatre in Brattleboro, Vermont has a variety of theater programs for kids of all abilities. First-rate staff and programs! Never took drama when I was younger, but I’ve always wondered what it’d be like! Maybe I’ll consider taking at least an amateur class for adults. I think playing an instrument and participating in orchestra can help, too. It’s taught me to be better at public speaking and observing and listening to others, which definitely helps with learning social skills. My Son Adrian 18 years old who is autistic and love drama. Would like to get some information about your classes. If only I had been as smart as your parents. My extremely intelligent son with aspergers says “that because he knew he was different he spent the majority of his middle school years studying others and learned how to create a character for himself to better fit into social situations.” Obviously there is something to this!! I loved reading about you and your journey. I teach acting for people with autism at Actor’s Workshop in Melbourne, Florida (Brevard County). Teaching acting is what I love to do and it is pure joy to teach students of all ages and needs. In addition, I have been asked to teach drama teachers how to teach acting to students with autism. This, too, brings me much joy knowing more people will be able to benefit from acting. The benefits are so enormous for all – and at any age. Thank you for writing your acting/theatre experiences down for other. I found your article inspiring, motivating and encouraging. Thank you for making a difference. I’m located in Orlando Fl and would like to know more about your program, but the website you added does not seem to work. Do you have an email I can contact you at? Reblogged this on Physical Folk. Hi. My nephew got diagnosed recently. In school he’s failed every class by this year mainted an A-B in drama! Do you know of any drama schools for special needs kids in or near orando, FL? 👋🏾 Hiii, my name’s Quintetta (Quintetta The Storyteller ™) Edwards, I was born and raised in New Orleans, LA. January of this year I started teaching an Inclusive Drama Class also and would love to chat with you about your journey, your classes, your experiences, receive advice, etc…Thanks in advance. Blessings and much! much, love to you👏🏾. My son attended Drama classes in Dublin Ireland for 8 years. They were run by Aspire (Asperger Syndrome Association of Ireland) under the direction of Dr. Carmel O’Sullivan of Trinity College Dublin. They were of great benefit and Dr O’Sullivan had an article published in the Harvard Education Review.